Since the first building was finished, we started on the second one. This one is on our own property on the other side of the village. 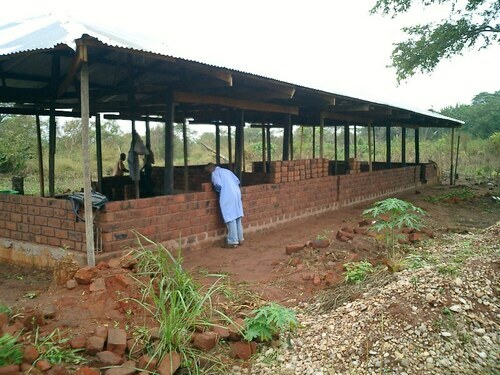 It's about half an hour walk from the first building and having no truck or jeep available, it was the women again who eagerly helped with transporting the bricks to the new location. 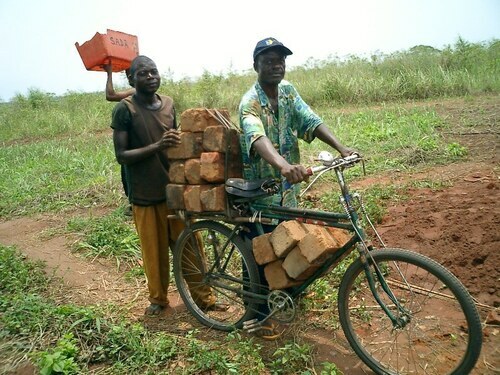 There were also some men who participated with this, but they used bikes on which they piled about 20 bricks and that way they could make a nice income. We used the wood from a hangar for making the rafters. Putting these up with just man-power was quite a feat, but it worked. The walls are now 11 bricks high. The next step is to make a "centuron" of iron bars and concrete around the building right above the windows and doors to give the building strenght.